An apicoectomy, also called a surgical root canal, is a dental treatment for an infected tooth root. An apicoectomy involves surgically removing the tip of the root and the infection. 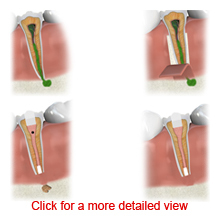 A filling is placed at the root tip to prevent re-infection. An apicoectomy may be necessary if root canal therapy fails or is not an option. In the majority of cases, root canal treatment is successful. Some people may need a repeated root canal treatment. Root canal treatments are used to treat pulp infections. Pulp is the soft substance inside of your teeth. It can become infected when a cavity or opening in a tooth’s outer layer allows bacteria inside. However, in cases when root canal treatment has failed or is not an option, an apicoectomy may be performed. A pulp infection may or may not cause pain. You may notice a bump that resembles a pimple on your gum. You should contact your dentist as soon as possible to ensure prompt treatment. Your dentist can examine a re-infected tooth by carefully examining your teeth. X-rays are used to show if there is a problem. After numbing your gums, your dentist will make an incision. 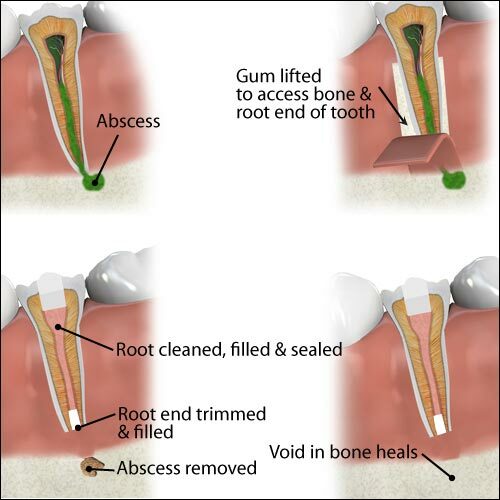 The inflamed gum tissue, the root tip, and infection are removed. A root-end filling is placed to prevent re-infection of your tooth. Sometimes a bone substitute might be place to help with healing. Your gums will be closed with stitches. After a few months, the bone around the tooth root will heal, restoring full function. You may experience slight swelling and discomfort following your procedure. Your dentist may recommend a pain reliever and an icing schedule. Your dentist will advise you of any restrictions. Stitches are usually removed 5 to 7 days after a surgery.